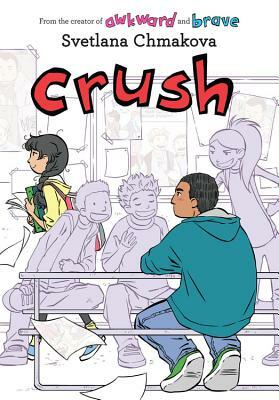 Following the overwhelming success of AWKWARD and BRAVE, Svetlana Chmakova's award winning Berrybrook Middle School series continues with its next installment - CRUSH! Jorge seems to have it all together. He's big enough that nobody really messes with him, but he's also a genuinely sweet guy with a solid, reliable group of friends. The only time he ever really feels off his game is when he crosses paths with a certain girl... But when the group dynamic among the boys starts to shift, will Jorge be able to balance what his friends expect of him versus what he actually wants? Svetlana Chmakova was born and raised in Russia until the age of 16, when her family emigrated to Canada. She quickly made a name for herself with works like Dramacon, Nightschool, the manga adaptation of James Patterson's Witch & Wizard, and the webcomic Chasing Rainbows. She graduated from Sheridan College with a three-year Classical Animation Diploma. Her latest work for middle grade readers, Awkward, has been a runaway critical success and was named one of YALSA's 2016 Top Ten Great Graphic Novels for Teens!